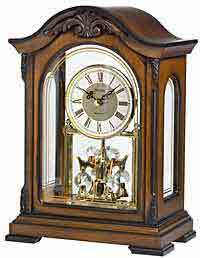 Howard Miller 635-194 Collins Mantle Clock is a square metal clock with a decorative faux bell on top of the case. The antique black finish is artificially warn as to appear old. The round ball feet match the case. The aged yellowed dial is protected by a glass crystal. The block style Arabic numerals are charcoal in color and match the spade hour and minute hands. The accurate Quartz battery operated Non-chiming movement requires 1 "AA" battery. 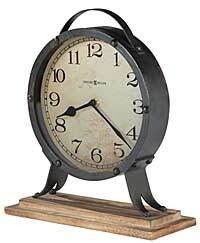 Clocks for sale at The Clock Depot including the 635-194 at discount prices.